Available in 13 oz. (net wt.) aerosol cans and 1 quart cans. For best results, apply Thurmalox 250 by spray. IMPORTANT: To ensure maximum performance, coating film thickness must be carefully controlled. 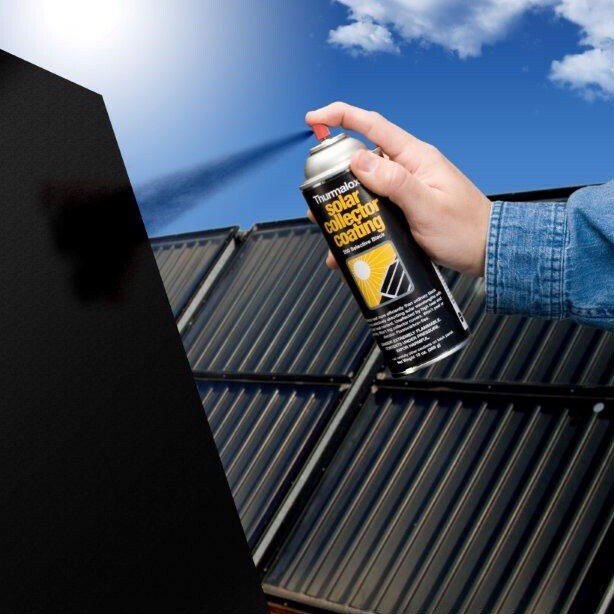 For maximum selectivity, spray apply a very thin coating, only enough to just hide the metal surface and to make it uniformly black in appearance. Apply only one coat to a maximum dry film thickness of 0.10 mils (0.4 mils wet film thickness - unreduced; 0.8 mils wet film thickness - reduced 1:1 with the recommended Thurmalox thinner. In the case of steel surfaces additional consideration must be given to the potential problems of corrosion and rusting of collector surfaces and appurtenances. Under such circumstances corrosion can be effectively prevented by applying a prime coat of thurmalox 245 Silicone-Zinc Primer prior to application of the Thurmalox 250 Selective Black Coating. The use of thurmalox 245, however, will inhibit the selectivity of the coating system. Apply one coat of Thurmalox 245 to a dry film thickness of 1-1.5 mils. Apply one coat of Thurmalox 250 to a dry film thickness of 1-1.5 mils. Total system dry film thickness: 2-3 mils. See Bulletin 245 for detailed information. NOTE: To ensure maximum performance characteristics, emissivity measurements should be taken as a control procedure. See Selectivity Data in Technical Data section. Best results are achieved with conventional spray application or aerosol spray. Reduce with equal volume of Dampney 100 Thinner. Adjustments for proper spray patterns may be required. Pot pressure - 2-5 lbs. Atomizing pressure - 30-35 lbs. Distance from work - 8-19"
*Smaller hose diameters, or hose lengths greater than 25 feet may make it necessary to increase pressure. Thurmalox 250 dries to handle in 30 minutes. For optimum service, coating can be baked one hour at 350-400°F although curing will occur in service. Store Thurmalox 250 in a cool place, preferably below 80°F. Surface temperature at time of application 50-120°F (10-49°C) max. (spray cans, 75°F (24°C) max.